First upgraded ballistic missile submarine has left Severodvinsk and embarked on comprehensive sea trials. Several Russian media, including military TV channel Zvezda and newpaper Rossiskaya Gazeta, reports the new submarine to be based with the Northern Fleet and not with the Pacific as previously assumed. That will happen next year. First, «Knyaz Vladimir» will confirm its technical readiness through a series of sea trails. The sub is the first Borey-A class, an upgraded version of Borey which the Russian navy already has three of. A photo of the new ship sailing out from Severodvinsk in the dark was first published by the blogsite BMPD Livejournal. Main differences compared with the first three Borey-class submariens are better maneuverability, less noisy and some design changes on the hull. The main weapon is still 16 Bulava missiles which can carry 6 to 10 nuclear warheads each. If fully armed, the submarine will then have 96 to 160 nuclear warheads on board. With the Northern Fleet, the Borey-class submarines are based in Gadzhiyevo on the Kola coast to the Barents Sea. 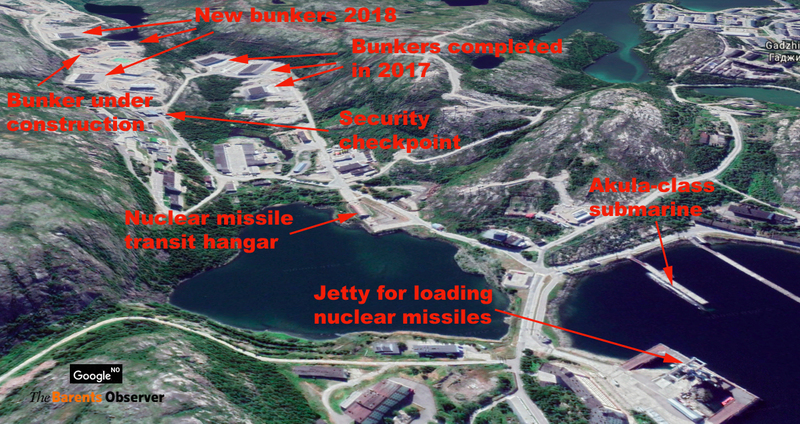 Earlier this autumn, the Barents Observer published recent satellite photos showing a upgrade of storage bunkers for missiles both in vicinity of Gadzhiyevo and at the main weapons deposit in Okolnaya Bay near Severomorsk. When put into service in 2019, will be the second Borey with the Northern Fleet. «Knyaz Vladimir» The first, «Yury Dolgoruky» was commissioned in January 2013. The two other, «Aleksandr Nevsky» and «Vladimir Monomakh» are both sailing for the Pacific Fleet. Senior Research Fellow with the Norwegian Defence Research Establishment (FFI), Kristian Åtland, says it is natural to believe the eight Borei-class submarines will be divided 50/50 between the Northern and Pacific fleets. «The Northern Fleet got the first. The two next went to the Pacific and now the Northern Fleet gets the fourth,» Åtland says and anticipates vessel 6 and 8 also to get the Northern Fleet’s Gadzhiyevo base as homeport. Gadzhiyevo naval weapons and missile storage. The four Borey-class submarines under construction at the yard in Severodvinsk are «Knyaz Pozharsky», «Knyaz Oleg», «Generalissimus Suvorov» and «Imperator Aleksandr III». By 2021, if schedules are not delayed, all eight Borey submarines will be on active duty. In May, Barents Observer quoted TASS stating up to six addition Borey subs could be built within the state armament program lasting until the end of 2027. Now, another TASS report suggest construction of the first additional ballistic missile sub of the class could start in 2024 and the second in 2025 with an aim to join active service in 2026 and 2027.